We have designed all our garments to accomodate active working conditions. Our sizing is true to the size listed on the product page, so please use the instructions below as a guide to help in the measuring process. As a general rule of thumb, it is typically best to have someone help you take the measurements. Do not measure over baggy shirts or slacks. Hold tape measure close but not tight against the body. Bust/Chest: With arms at sides, measure across the fullest part of the chest, under arms and across shoulder blades. Keep tape measure straight and parallel to floor. Waist: Measure at your natural waistline at its smallest part. Hips: Measure across the fullest part of your hip. Neck: Measure around base of neck (lowest part). Number of inches equals neck size. 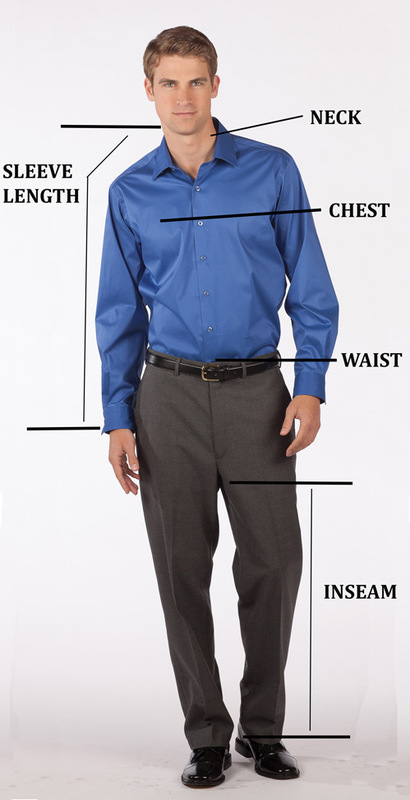 It is typically recommened to add 1 inch to the neck measurement for comfortable fitting shirt collar. Sleeve Length: Start from the center of the back of the neck and measure across the shoulder to the elbow and down to the wrist. Chest: With arms at sides, measure across the fullest part of the chest, under arms and across shoulder blades. Keep tape measure straight and parallel to floor. Waist: Measure your natural waist at the height you normally wear your pants. Keep the tape measure firm but not tight. Inseam: Measure inside of leg from crotch down to top of shoe. Or, measure a similar style of pants that fit well. Measure from the crothch seam to the hem.